Next Meeting: April 12, Location: Multi-Purpose Room, Hillview. We all send out get well greetings to John Brugo who is under the weather these days. We are routing for you John. Next meeting is Tues, April 12. Agenda is TBD. See the home page for the details as they develop. There are more requests below for feedback, which have been almost totally ignored in the past weeks. I would suggest to the members that this feedback is useful and needed if you want your voice to be heard. Denise gave a wonderful presentation on how she came to make purses from turned wood. 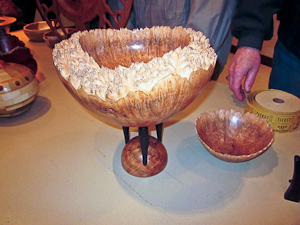 She covered a wide range of designs, showing how to as well as the story behind this unusual area of wood turning. See the page on the website for more pics and links. Thanks to Carolyn for the photpgraphy. Do visit the poll page to give feedback on the meeting, for Pat wanted me to see if folks would be interested in having her back for a weekend hands on demo. There were a number of folks who brought items to the meeting for presentation. Pres Challenge was a hard to turn piece of wood, and there were some quite interesting turned pieces. Lonnie brought a challenging platter that had a notch in it. Good luck with that going forward. Don't hurt yourself. 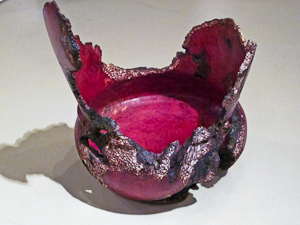 Claude brought a natural edge Manzanita Bowl that he is entering in the Turning 25 competition. See below. Ed Howe had a natural edge piece. Budd brought a Chinese Elm natural edge also. 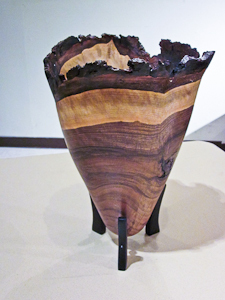 Tom Haines brought a lamp shown at right that had a turned shade on top of a burned base of walnut. Bob Tang showed us a birch that was a hallow form. 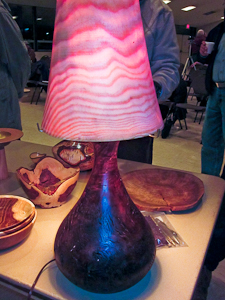 Don Jensen displayed a marvelous carved piece, a hanging sculpture. 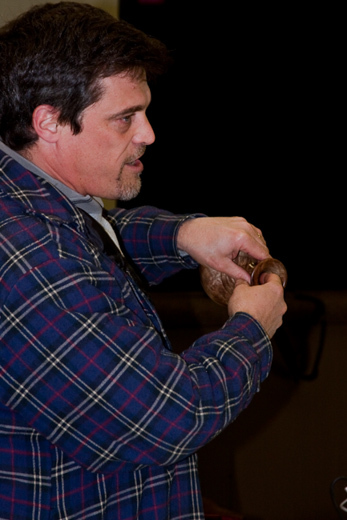 In Show and Tell, Harvey Klein had a very small natural edge piece out of Ivory Palm. Quite unusual. Cecil took a very good attempt at his first segmented bowl. A member whose name I missed brought in some lovely rounded bottom, tall hallow forms. See pics at left and right. Also one of the members displayed longer pen kits. 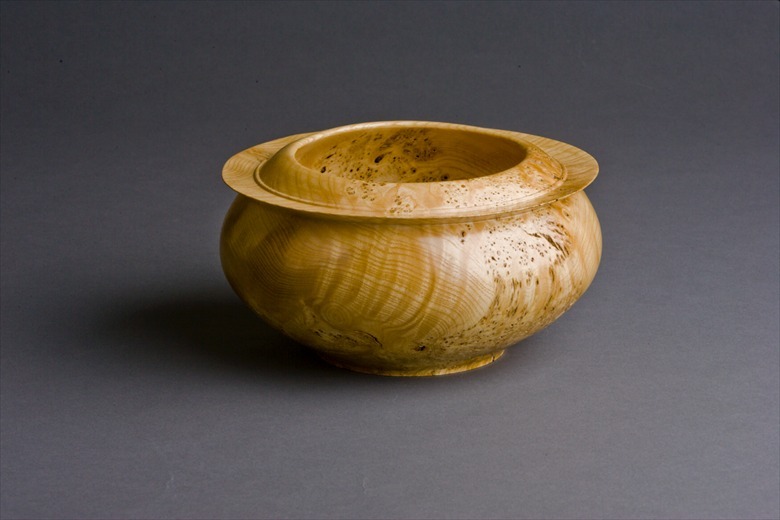 .Anderson brought in multiple bowls made from the Mulberry that was supplied by the official Club Woodchuckers (Cecil and Ron). There is a new poll on this Mar meeting on the website that will provide good feedback. See this link and add your 2 cents. The time is now to vote on the piece to send to the "Turning 25" entry at AAW. Remember that this is the single turned piece that fits in a 8x8x8 in cube. See the entries at this Link and vote on which one to send. Deadline is the end of the first week in April, before the next club meeting. I will take late entries until Mar 20th. The newly formed Program Committee is off and running well, having now organized 2 club meetings. Look for some discussion on surface texturing and surface decoration in the April, May meetings. If you know of someone local who could contribute to these meetings either in a panel or a solo presentation, then let the committee know. They are asking for your input on whether or not you have any specific interest and if you would be a part of a demo team or panel. Onsite videos taken at a member's shop will be pushed in the coming months. This committee has a lot of energy and purpose, so please give them support and input. For a job well done and done with the continued time and effort on both of their parts. The pieces of privet followed last month's walnut, and it is most appreciated. Every week these woodchucks are busy. They have arranged a place for the wood to be stored for club members to come pick it up. The information on where it is and how to arrange access is at this Link. Starting an online Turning Forum on Bowl Finishing: Come Join! Most have experience in using and being a part of a online forum, help group or some other iteration. I have installed on our website the capability to have a totally interactive forum for our club on any topic that a member wants to initiate. I ask at this point, if you are interested in participating in a forum on finishing, to send me an email. 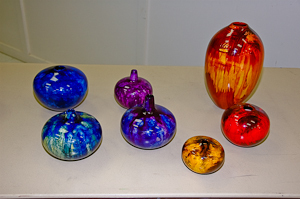 If you are interested in learning more about clear finishes to wood bowls then here is your chance to blaze a new path. Just let me know. After I have a few interested folks then I will send out instructions and can also answer questions. This could be quite dynamic and useful. I am looking forward to learning more about difference kinds of finishes and means to use in various applications. Demo was on March 13th. Anyone who went please send a report and a brief summary to me. Thanks. Thanks to LeRoy for sending me pics. Send me some text someone and I will add a page with LeRoy's pics. The Club website will be undergoing some changes in look and menu. Check out the new homepage link to see the new home page as it is being built. Right now there is part of a heading that is in place, but the background, colors, etc. will be also changing. Send me any ideas and pics. Sometime in April I will load the new one to the official home page. Peter wanted me to mention a special thanks to those who continue to contribute tops for the children in the Children's Hospital at Stanford. He had received quite a few just at this meeting. Peter has delivered over 1500 tops to the RM Center - amazing work Peter.